Wow! You guys are GREAT! We’ve gotten quite a few new stories in the last few days, we are so grateful to everyone who has taken the time to submit their child’s story… we have almost 60 stories on the site. So, bottom line: there’s still time! Get your story to us by midnight on Sunday and you’ll be entered for the giveaway. 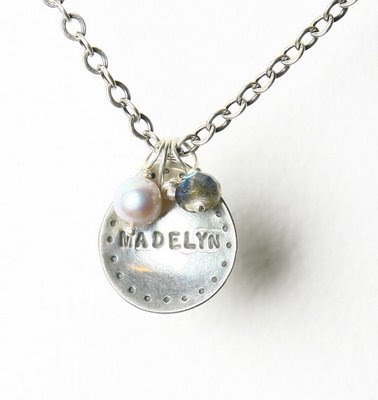 Winner of the Suzanne Myers Name Charm necklace to be announced Monday!! You are rocking girl! It has been such a blessing to read all of the stories – it is all worth it if even ONE person is moved to adopt a special needs babe from China! These are amazing times!! Ok, I finally emailed it! Phew! And of course, you know I have the button on my blog! Stefanie, I had to tell you that we have been able to add some SN to our list b/c of NHBO. There are so many SN that I know are out there. I am so thankful to the work you guys have put into this website to help educate us all. I encourage all parents of SN children to please submit a story. Educate us PAPs. There are so many SNs that are not on the agency checklists! We even found a need on our checklist that we did not check off b/c we thought the cost would be too much since our insurance will not cover pre-existing conditions. After reading a story on NHBO, we researched the treatment mentioned for the SN and we realized we could afford it! So, in a matter od a weekend, we have added 2 more SN to our checklist! May God bless you greatly for the work you are doing! Stef, I have been trying to work on Ryan’s story but honestly the words are just not coming. So I will get it to you but not by the deadline tonight. That is ok though. It is most important that I eventually just get it done!